Follow up to Three wise men. A certain king wishes to determine which of his three wise men is the wisest. He arranges them in a circle so that they can see and hear each other and tells them that he will put a white or black spot on each of their foreheads but that at least one spot will be white. In fact all three spots are white. He then offers his favor to the one who will first tell him the color of his spot. After a while, the wisest announces that his spot is white. How does he know? One way of visualizing the solution is to think hypothetical scenarios where some of the men have black spots in their foreheads. Lets start supposing that two of the men have black spots: then it will be obvious to the third that he has a white spot, as at least one of the three must have one. Now suppose that only one of the men has a black spot and take the point of view of the “wisest” (quicker at least) man with a white spot. He cannot directly infer the color of his spot, as he sees one spot of each color. But, as we have seen in the last paragraph, the man in front of him with a white spot would have known the color of his spot if he (the observer) would have had a black spot in his forehead. As he didn’t speak, then he knows that the color of his spot must be white. Finally, lets attack the full problem taking the place of the wisest man. He knows that, if he would have had a black spot in his forehead, one of the other men would have spoken, by the previously mentioned reasons. As they haven’t done that, he can conclude that the spot in his forehead must be white. There is an island upon which a tribe resides. The tribe consists of 1000 people, 100 of which are blue-eyed and 900 of which are brown-eyed. Yet, their religion forbids them to know their own eye color, or even to discuss the topic; thus, one resident can see the eye colors of all other residents but has no way of discovering his own (there are no reflective surfaces). If a tribesperson does discover his or her own eye color, then their religion compels them to commit ritual suicide at noon the following day in the village square for all to witness. All the tribespeople are highly logical, highly devout, and they all know that each other is also highly logical and highly devout. One day, a blue-eyed foreigner visits to the island and wins the complete trust of the tribe. One evening, he addresses the entire tribe to thank them for their hospitality. However, not knowing the customs, the foreigner makes the mistake of mentioning eye color in his address, mentioning in his address “how unusual it is to see another blue-eyed person like myself in this region of the world”. What effect, if anything, does this faux pas have on the tribe? Given are X and Y, two integers, greater than 1, are not equal, and their sum is less than 100. S and P are two mathematicians; S is given the sum X+Y, and P is given the product X*Y of these numbers. Hint: a computer is very useful to solve this problem. Solution for both puzzles in the next post. In a previous post (and in a comment from Guille [ɡiˈʒe] 😀 ) we have seen how the pigeonhole principle implies that a set of 70 numbers in the range [1018, 1019) must have two subsets with equal sum. 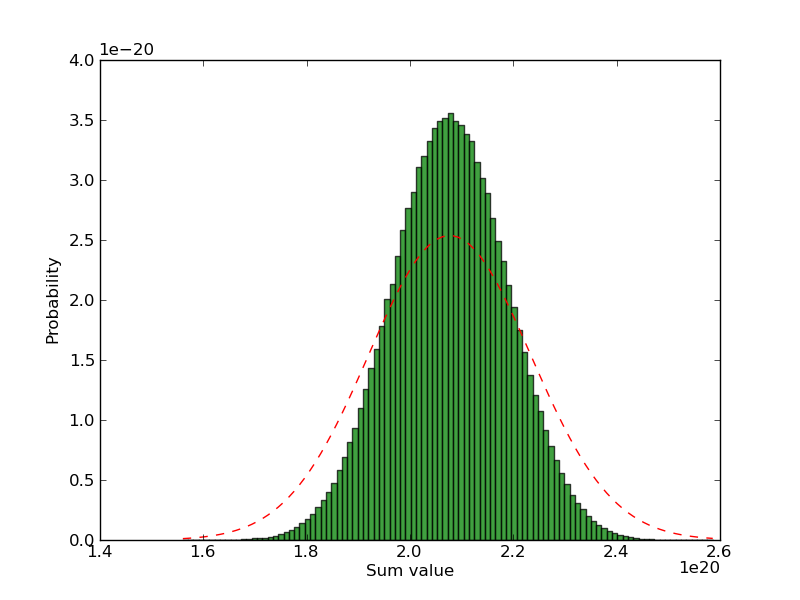 But this is a non-constructive proof, as it doesn’t give us the two subsets with the same sum. To rectify this omission, in this post we will see how this “sum collision” can be obtained. We can start by defining the problem in a more general way: given a sequence of elements xi and a function f(), find two elements of the sequence, xj and xk, such that f(xj) = f(xk). In this way the sum collision problem can be reduced to finding a duplicate in the associated sequence of sums, f(xi). The first one has O(n log n) complexity and the second one has O(1) complexity if we use a hash-based set. As the set-based approach also has a lower constant, we will use this approach in the rest of this post. This algorithm works well if the sequences to be inspected for duplicates can be fit entirely in RAM, but in this case we have seen that tens of billions of elements must be inspected to have a high probability of finding a collision. In the next section we will analyse how this restriction can be evaded. Each of the subsets to be evaluated in this problem can be encoded using 70 bits and, to allow a simple and fast sum calculation algorithm to be used, this was rounded up to 10 bytes. Then, if we want to inspect 20 billion subsets of 35 elements to get a very high probability of not wasting the calculation time, we will need 200 GB to store the whole sequence. 200 GB of data cannot be stored in the RAM of an usual machine, but it’s quite easy to store this amount of data in a hard disk nowadays. Generate in RAM a big number of random subsets and sort them by their sums. Find a vector of numbers (to be called “pivots”) aplitting the sorted subsets vectors by their sums in approximately equal-sized segments. (The segment n will be composed by all the subsets whose sum is between pivot n-1 and pivot n). Split the sorted subset vector in segments using the previously generated pivots and append each segment to an associated segment file (for example, append segment 3 to 0003.bin). Repeat steps 3 and 4 until getting enough subsets. Check each segment file at a time for collisions. If we choose enough pivots, the size of each segment file will be small enough to allow easily doing step 6 with a hash-based set (each segment file won’t have the same size, as the generated subsets are random; but the law of large numbers ensures that their sizes won’t be very different). Number of subsets in RAM: 107. Number of elements in each subset: 35 (constant). Number of slots in the hash-set: 227. The first stage (segment file generation) elapsed time was approximately 41 hours, somewhat over my original estimation of 36 hours, and the segment file range ranged from 194827630 bytes to 206242980 bytes. The second stage (collision detection inside each segment file) lasted for 12-18 hours. Processing file 218...  Collision between identical elements. Processing file 363...  Collision between different elements!!! Processing file 394...  Collision between different elements!!! Processing file 409...  Collision between different elements!!! Processing file 434...  Collision between different elements!!! Processing file 475...  Collision between different elements!!! Processing file 655...  Collision between different elements!!! Processing file 792...  Collision between different elements!!! and its sum is 203743882076389458417.
giving us an infinite recursion. La solución es mucho más simple de lo que podría parecer a primera vista y se basa en el el crecimiento exponencial de la cantidad de subconjuntos respecto al tamaño del conjunto “base”. 0 ≤ S < 70·1019 < 1021. S < 1021 < 270. Pero, como la cantidad de subconjuntos de un conjunto de 70 elementos es exactamente 270, acabamos de probar que hay más subconjuntos que posibles valores de la suma de sus elementos. Por lo tanto es inevitable que haya al menos dos subconjuntos con el mismo valor de la suma de sus elementos. Como obviamente A\B y B\A no pueden compartir elementos, entonces cada par de subconjuntos distintos con igual suma tiene asociado un par de subconjuntos disjuntos con igual suma. Este problema es conocido como NP-completo, por lo que no cabe esperar una solución eficiente y general. Pero podría ser que con estos valores de parámetros fuera factible encontrar una solución particular por lo que realizaremos un análisis probabilístico. Consideremos una distribución aleatoria uniforme en el intervalo (0, 1019): claramente tendrá una densidad de probabilidad constante e igual a 10-19. Esto implica que si elegimos un número aleatoriamente de esa distribución, considerándola ahora discreta, la probabilidad sería de 10-19, lo que concuerda con nuestra intuición. Comparación de un histograma de las sumas de combinaciones de 35 números con la aproximación normal. se observa que, aunque la coincidencia de la media es muy buena, la desviación estándar de la normal es significativamente superior a la que se observa en el histograma. Esto se debe a que, a diferencia de lo que se supone en una distribución Irwin Hall, las variables sumadas no son independientes (podemos verlo más claramente pensando en el caso de 70 variables: la suma es única, pero la distribución de Irwin Hall nos daría una desviación estándar aún mayor que en el caso de 35 variables). Como este error nos lleva a sobrestimar la dificultad de encontrar una colisión, podemos ignorar esta discrepancia por el momento, ya que nos llevará a una aproximación conservadora. Lo que necesitaríamos ahora es calcular la probabilidad de encontrar dos combinaciones con igual suma. Aunque queda claro que las probabilidades son mayores que en el caso de que las sumas estuvieran distribuidas uniformemente en el intervalo (0, 70·1019), no es tan simple calcular un valor exacto para esta probabilidad. Pero podemos hacer una estimación suponiendo a los valores distribuidos uniformemente en el intervalo ±1σ, lo que implica descartar menos del 35% de los valores. Tomando en cuenta que se está desechando el 30% de los puntos, podemos concluir que examinar unos 2·1010 puntos nos debería dar una probabilidad elevada de encontrar una colisión. Si bien es bastante complejo buscar una colisión entre más de 1010 valores, no es infactible. Pero sería mejor realizar algunas pruebas preliminares para ver si el resultado obtenido es razonable. 0 ≤ S < 30·107 < 109 < 230. Para poder encontrar una colisión en forma explícita en el problema original deberá ser necesario buscarla entre aproximadamente 1010 valores. Como cada subconjunto con su suma ocupará en el orden de 16 bytes y una PC suele tener menos que 100 GB de RAM, sería práctico buscar un método que permita buscar colisiones sin tener todos los valores previamente analizados en memoria (otra opción sería usar datos en disco, pero es menos elegante 😀 ). En un próximo post analizaremos como implementar una solución a este problema y veremos si pueden encontrarse resultados.